Daniela Cascella in En Abime-Listening, Reading,Writing. 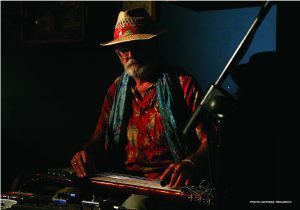 But then there was Mike Cooper, hat-shadowed face, Hawaiian shirt and a steel guitar wired into a table of electronic business. 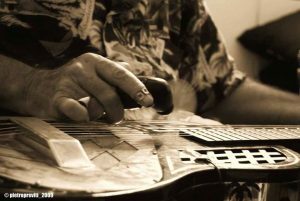 He began raga-like, an unhurried deconstructed blues-boogie, his fingers nimble across the gadgets stretching and overdriving the sound, letting new elements evolve before sweeping them aside and derailing the music into something else. Grabbing a lyric sheet from a pile on the floor he delivered songs like The White Ship’s Silence, moulding the soundscape to fit them into what was a single stream of consciousness. It was a truly riveting performance, so much was happening so fast at times, yet nothing out of place or effortful. It was never far from the blues either, though he somehow never exactly got there until the end and a straight slide-guitar accompaniment to Van Dyke Parks song Movies Is Magic. It is great that a new generation is developing free music and deploying the technology of our times to do it, making it all the more important to recognise a master musician like Mike Cooper who has spent nearly forty years doing just that and remaining ahead of the curve. – The Old England Bristol – Tony Benjamin – 2018. “His eclectic attitude has often embraced the idea of re-representing a multitude of cultural references , through a very particular way of mixing elements and fantasies into a visionary model that goes beyond the simple idea of multiculturalism” – NERO magazine – Valerio Mannucci. “ Cooper’s music, in any of its forms, seems drunk on the intermingling of folk traditions, searching for a spot between them all that renders the strange familiar and vice versa. 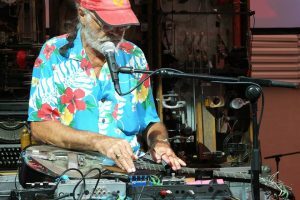 He is an improvisatory musician, one who generates his music in sheets, loops, and layers, and he seems to accrete these found-sound albums like a spider spins silk, or a vine grows pumpkins. They just appear, fattened and ripe, the fruits of his memories, travels, and idiosyncrasies.” – Pitchfork. Welcome to those who already know my work and to those who don’t…. For the past 50 years he has been an international artistic explorer constantly pushing the boundaries. 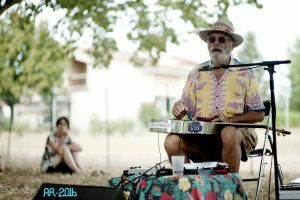 He plays lap steel guitar and sings, he is an improviser and composer, song-maker, a visual and installation artist; film and video maker and radio arts producer. 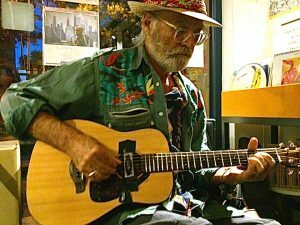 Initially a folk-blues guitarist he is as responsible as anyone else — and more so than many — for ushering in the acoustic blues boom in the U.K. in the mid ’60s. He has, arguably, stretched the possibilities of that genre even more than his better known contemporaries Davy Graham, Bert Jansch, John Renbourne etc. by pursuing it into the more avant-garde musical areas occupied by guitar innovators such as Elliott Sharp, Keith Rowe, Fred Frith and Marc Ribot, with an eclectic mix of the many styles he has practiced over the years. 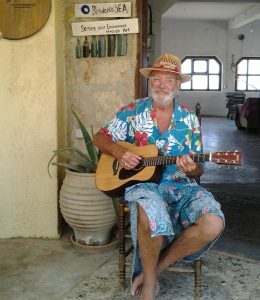 Ranging freely through free improvisation, his own idiosyncratic original songs, electro-acoustic music, exotica, traditional country blues, folk, pop songs, and ‘sonic gestural’ playing utilising open tunings, extended guitar techniques and electronics. Solo performance of voice and guitar – Songs produced using methods similar to William Burroughs and British artist Tom Phillips techniques of cut-up or random selection and/or elimination of texts, working in particular with Thomas Pynchon’s two novels Gravity’s Rainbow and V. When performing Spirit Songs live both the sung melody and instrumental accompaniment, usually with guitar and electronics, are freely improvised rendering each performance totally unique. For the past 25 years he has composed and performed worldwide at festivals, cinemas and other venues with Live Music For Classic and Contemporary Silent Films. Among them F.W.Murnau’s Tabu; W.S.Van Dyke’s White Shadows In The South Seas; Legong by Henry de La Falaise and Fratello Mare by Folco Quilici, all performed solo, plus Eisenstein’s Que Viva Mexico scored for a small orchestra. Both White Shadows and Fratello Mare have been released as c.d. and vinyl lp records. Archilochus (Greek Poet 680bpe – 645bpe). ‘Island Gardens’ is an on-going multi screen short video installation project connecting small island cultures around the world by exploring their sound, story, myth, magical thinking and visual beauty. Filmed in Bali, East Timor, Guadaloupe, Singapore, Hong Kong, Greece, and other exotic locations. Outback And Beyond, is a live audio-visual collaboration, with Australian video artist Grayson Cooke, described as an ‘electronic opera’ and has been performed in England, Spain, Greece, Germany, Norway, Australia and Japan where it won a prize at the 2013 Japan New Media Arts Festival in Tokyo. The libretto, written and sung by Cooper, references the installation of the telegraph across Australia by Charles Todd and his team in the 1880’s. Cook’s live video manipulation utilises found footage from the Australian National film archives. 2017 – Venice Biennale – with Pat Thomas/Mazen Kerbaj and Dr.Truna. 2016 – Artist in residence at SEA Heraklion Crete. 2015 – Artist in residence Cagliari (Sardinia) Capitale Italiana Della Cultura. 2013 – Artist in residence Singapore. 2013 – Artist in residence Syros (Greece) for Syros Sound Meeting. 2012 – Artists in residence Pulau Ubin (Singapore) for The Artists Village. 2008 – Some Sound Point Of View – short films and video @ GRIM Marseille. 2013 – Beach Peace – Lamma Island-Hong Kong. 2014 – A White Shadow In The South Seas @ Teatro in Scatola-Rome. 2014 – Island Gardens video collection @ GRIM Marseille. 2015 – Island Gardens video collection @ AIR Antwerp. 2015 – Island Songs illustrated lyrics @ AIR Antwerp. 2015 – Flirting With Flamingos @ Stazione Ferrovia di Cagliari-Sardinia. TRUTH IN THE ABSTRACT BLUES with Fabrizio Spera – Drums, Roberto Bellatalla – Double Bass. ‘The Limits of My Language are the Limits of My World’. Wittgenstein. SOME PAST INTERNATIONAL CONCERTS, SCREENINGS, INSTALLATIONS ETC. Onassis Centre Athens; MAXXI – Rome; MONA-Hobart,Tasmania; Institute of Modern Art Brisbane; Museum of Contemporary Art – Sydney; Experimental Arts Foundation Adelaide; Esplanade – Singapore; SAM – Singapore; National Arts Centre Tokyo; Metropolis Cinema Beirut; Beirut Arts Centre; University of Hong Kong; Honolulu Academy of Arts; Institute Of Contemporary Arts London; Auditorium Rome; Venice Biennale; GRIM Marseille; Athens Video Arts Festival, Greece; Japan New Media Festival Tokyo; Australian Film Festival Berlin; Casa Encendida Madrid; OUT Festival Lisbon, Portugal; Maria Matos Theatre Lisbon; Irtijal Festival Beirut, Lebanon; Brunswick Music Festival Melbourne; Nicklesdorf Jazztage Austria; Festival CABLE Nantes, France; Wellington International Jazz Festival New Zealand; Hula Dreams Triennial Sydney; Teatro In Scatola Rome; Cafe Oto London; Cinematek Oslo, Norway; London College of Communication – London; Kings College London; University of Bath, England; Southern Cross University Lismore,Australia; Griffith University Brisbane,Australia; University of Barcelona; DocLab Hanoi; Teatro Civico Cagliari; and many other smaller but equally significant venues.